Most peach trees (Prunus persica) are pruned to have an open branch system, meaning three to five lateral scaffold branches grow evenly around and up a trunk about 3 feet high. These are permanent scaffold branches that grow at no more than a 45- to 50-degree angle from the trunk. Fruiting shoots, the source of most pruning chores, grow annually from these scaffold branches. Peaches generally grow in U.S. Department of Agriculture plant hardiness zones 4 through 9, although individual cultivars vary within that range. 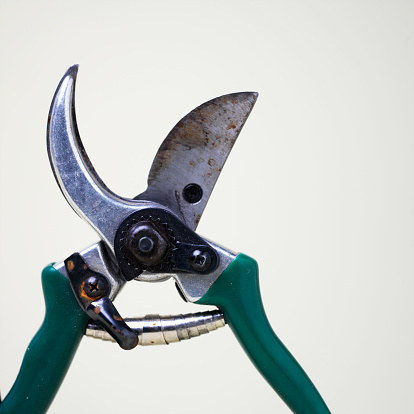 Because you'll be pruning shoots rather than branches, you'll need hand pruning shears. Wear gloves, a long-sleeved shirt and goggles. Prune shoots at a 45-degree angle within 1/4 inch of the branch. 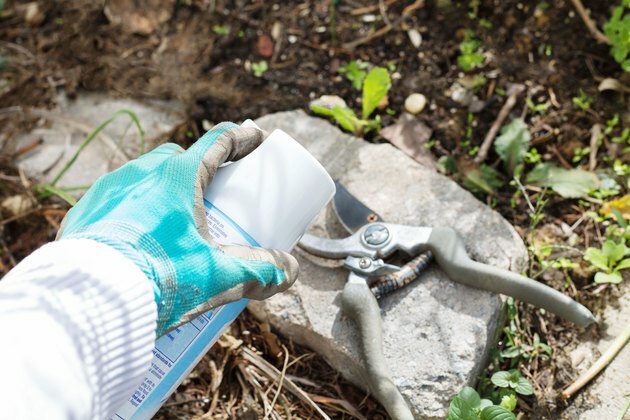 Spray the pruning tool blades with household disinfectant before pruning and before moving on to a new plant. 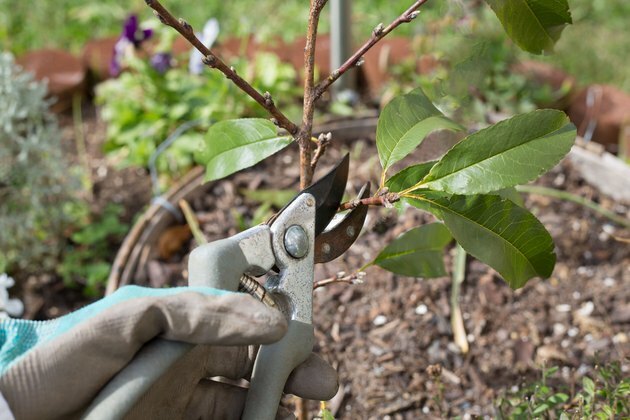 Prune a new peach tree to about 30 inches tall when you plant it. If you plant a branched tree, prune all but three or four lateral branches with an angle no greater than 45 degrees from the trunk. 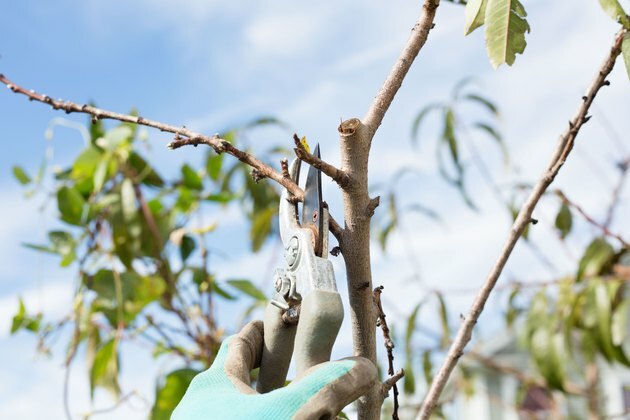 If your newly planted tree does not have branches, wait until summer to choose three to four scaffold branches that will grow peach-bearing shoots. The bottom scaffold branch should be roughly 24 inches from the ground. The top scaffold branch should be about 36 inches high. Remove all other limbs. You can also wait until just before growth begins in the second season to select and prune for scaffold limbs. The limbs of a properly pruned tree should form a rough bowl shape that makes picking peaches easier, plus lets in sunlight and air, both helpful in preventing diseases. When they're 3 to 4 years old, peach trees bear fruit on shoots that began growing the previous year. In early to mid-July prune low-hanging, broken and dead limbs then the vigorous upright shoots along the scaffold branches. Keep the center of the tree open by removing vigorous, upright shoots growing in the interior. Prune branches growing in the shade, those that hang downward and those that are thinner than a pencil. Keep pencil-thick branches that are 12 to 18 inches long. 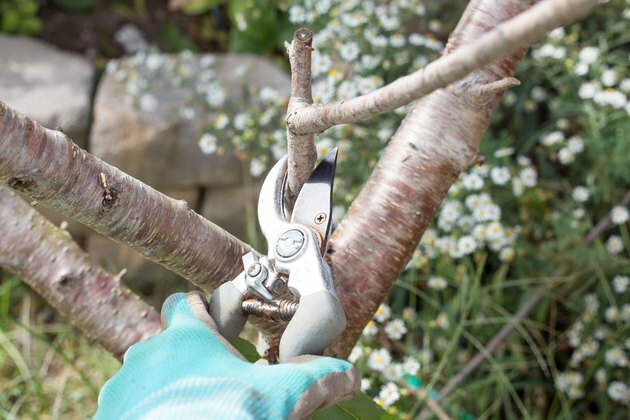 Prune about one-third of a fruiting branches longer than 24 inches. A peach tree needs from 70 to 90 fruit-bearing branches to yield a full crop. 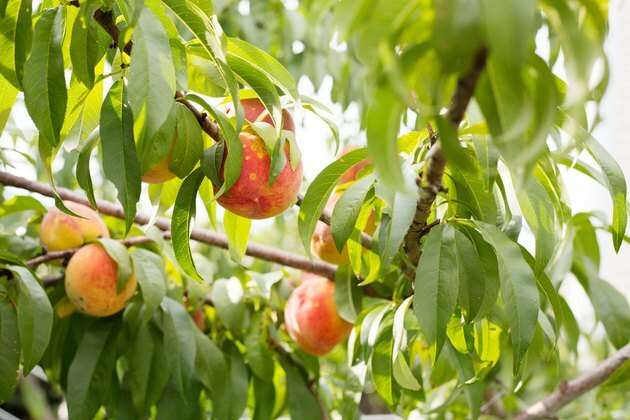 If you don't prune peach trees every year, the trees grow fewer fruiting shoots and those remaining move higher until the peaches are out of reach. 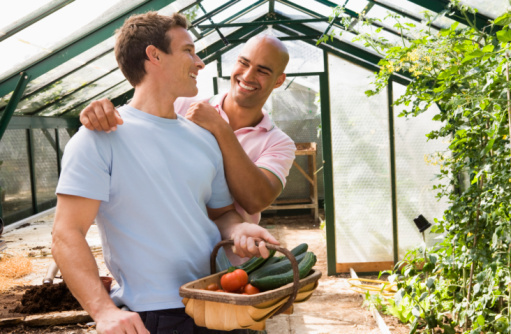 To stimulate new growth, prune about 40 percent of the shoots each year. Prune the ends of the scaffold branches to keep them at a good height for picking peaches. A peach-growing height of 7 feet is best, but of 8 to 9 feet tall is OK. Prune all gray wood within this zone. Leave small shoots alone but remove vigorous shoots that shade the center. Always prune to maintain the low, spreading bowl shape of the tree. Never prune a tree so heavily you don't have to thin the fruit.